I have been making a number of worldwide friends these days as a fairly new "Tweep", and one of those is Vincent, a Swiss private pilot who Tweets under the name PlasticPilot. He lives near Frankfurt and has most of his time in a PA-32 Saratoga. He also has a large handful of hours in one of GA's most exhilarating rides, the Diamond DA40 with G1000 instrumentation. He is "one of us" a regular guy with a passion for aviation. Recently, PlasticPilot made blog friends with a safety engineer at the Pilatus factory in Stans, Switzerland, which is sited in a most scenic part of this planet in the dramatic Swiss Alps between a mountain and lake. That e-friendship led to an invitation to tour the Pilatus factory, and Plastic Pilot has written a long and very good post about that tour here. Of note are the mentions of the PC-21 military trainer, and the many "NO PHOTO" areas where it is constructed. When we think of Pilatus, of course we all think of their uber-groovy PC-12, the does-it-all turboprop bizliner that can haul massive weights in pressurized comfort at efficient operational costs and then land on a dime and give you .07 cents change. I consider the PC-12 to be the one large aircraft I would buy tomorrow if those six Powerball numbers came my way, it simply eclipses everything in it's class in all categories, IMHO. I have known a few people who have been lucky enough to travel to Switzerland and take the Pilatus factory tour, and believe me, I am completely jealous. So PlasticPilot's blog post on the tour was welcome reading. If you are even remotely interested in the PC-12 or the Pilatus family of aircraft, go here and read the blog post...I promise it will be time well spent. One dream vacation I have always had on my long-term agenda is a trip to Tuscany and then up to Vienna by train to enjoy the visual and performing arts that this jewel of a city is known for. 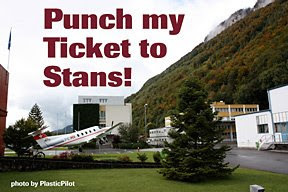 I now am adding a side-trip to Stans on that excursion, as it sure sounds like hanging out with a large number of Pilatus hardware and the people who craft them would be a great way to cap off a trip to the EU.